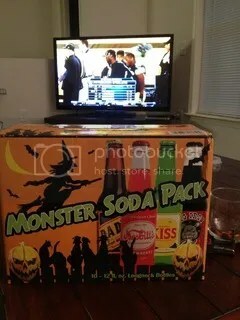 Box Awesome And Monster Soda. Soda. I have no idea how to market retail products nor do I pretend to. I am, however, a gullible consumer so most of this article is a tip of the hat to the box designer(s) of World Market’s Monster Soda Pack. They got me and next time I will take the three seconds to look at the package before forking over thirteen clams for NORMAL soda. But at least I have a pretty sweet box to show for it. I must have been in a fog of pre-Halloween glee because when I saw this variety pack there was no question whether this was coming home with me. 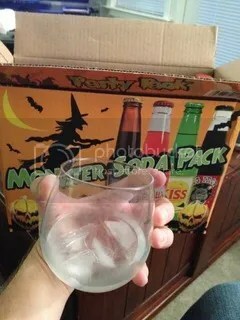 Had I known this was just a fancy box with random everyday soda, I probably would have passed and bought a dozen Halloween cards with fat cats posing in costumes while having Tootsie Roll indigestion. Fool me once, shame on me. Fool me twice? I’m a duck. Everything about this soda variety pack feels right from first glance. It is covered in 1978 Halloween goodness keeping every vintage art in tact and represented. An orange sky and witches make nights during the harvest so much richer. I have fond memories of 1983 Kmarts with just this tone of orange. 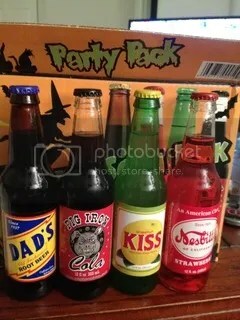 There is no question that these four sodas are about as Halloween-like as my Aunt Rose. (In her later years she thought Halloween involved fireworks and oranges) There is also not a question that these four brand sodas are the most common in the World Market selection so it leads one to believe that by disguising them in a Halloween box, they can recoup some overstock. But, if you think about it, isn’t that what Halloween is all about? They are just wearing a Halloween costume and I was tricked into buying a treat! I am an eternal optimist and a sucker for writing like an uncreative third grade home-school teacher. Luckily for me most defeat can be soothed by liquor. So what that these sodas don’t have names like “Linda Blair Lemon/Lime” or “RedRum Rootbeer” and they are just everyday brands with questionable expiration dates? The box brought a bit of nostalgic happiness and I would not normally buy strawberry soda. Actually, I don’t think I have ever bought strawberry soda. Okay, one more complaint. The handles to Box Awesome are not awesome. In fact they caused a scene in the parking lot but luckily for me the Earth rotates only so fast and the moon is only so close because any closer of faster, I would be the owner of a wet Box Awesome, filled with glass shards. That was a gravity joke. I just downloaded my most favorite free app for the iPhone and iPad. Zoomvision’s Night of the Living Dead app has me so happy I might just super lunge to the beat of “I Love A Rainy Night” by Eddie Rabbitt. It’s the whole movie and it takes up virtually no space. How that works, you tell me. But it’s fun to sit in a waiting room or before a board meeting and watch Barber’s older brother taunt her before getting his head smashed by a zombie. 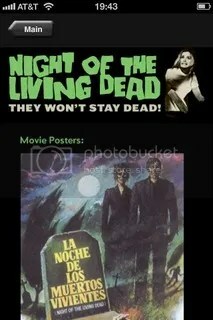 Just a bit of horror to break up an otherwise dull day. Excellent review! 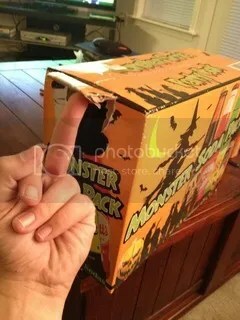 I shall be on the lookout for this box in my area. I always wondered what soda from 3rd world countries taste like. Man, my neighborhood K-Mart closed about a year ago — such a bummer, I remember riding my bike there as a kid and getting the fried shrimp and fries basket. Also, my mom used to sing that “I Love A Rainy Night” song whenever it rained. Love this. I have heard of all those sodas but Big Iron. Last week, I bought a bag of candy exclusively because it had Demon Treats written in huge letters and I was going to do a post on it. Of course, Max found it, opened it, and threw the bag away before i could take a picture. *Sigh* At least there’s chocolate in the house.